Nvidia released a new WHQL graphics driver 388.43 for Windows earlier today which brings back NV Tray and Game Ready support for Doom VFR. The new driver is already available on the official Nvidia download drivers web page for download. Tip: You can use TinyNvidiaUpdateChecker to check for driver updates and install them without using GeForce Experience. As usual, it is recommended that you remove the old Nvidia display driver fully before you install the new driver on the Windows PC. You may also want to check out our guide on installing only the drivers that you require, and how to disable Nvidia Telemetry tracking and Nvidia Telemetry after installation. You find information on Nvidia services that may run on your system after installation here. As usually, a new WHQL driver improves support for some games. This one comes with Game Ready settings for Doom VFR, the first virtual reality game of the popular Doom franchise that was released today. Windows users who miss the NV Tray application that Nvidia removed earlier may be delighted to hear that the company brought it back from the dead with this release. 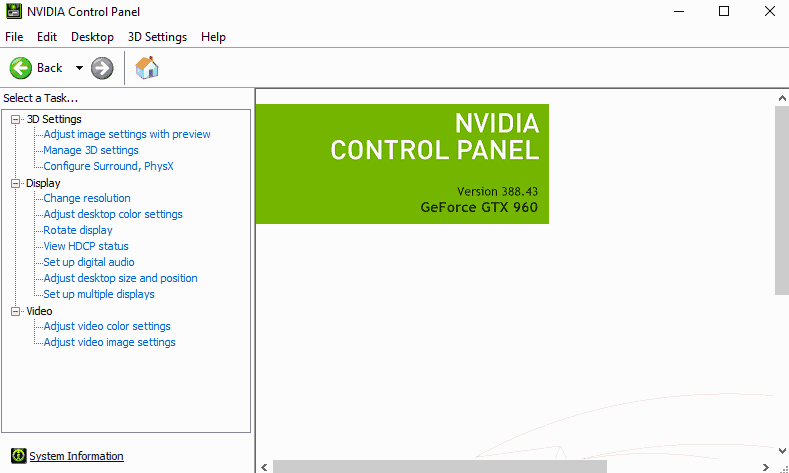 While there is not much to it right now, it just lets you open the Nvidia Control Panel or GeForce Experience from the System Tray area, it appears that quite a few users requested the feature's return. Note that you can also right-click on the desktop to go to the Control Panel. There is no dedicated nvtray.exe process however anymore. The new Nvidia GeForce driver 388.43 fixes two issues. The first fixes a crash and hang issue with cross-adapter clone mode enabled, the second a Wolfenstein game crash on notebooks. No display output on GeForce GTX 780 Ti systems when connecting the DisplayPort and two DVI monitors. OS fails after installing the GeForce Titan (Kepler based) graphics card on a Threadripper-enabled mainboard. System hangs when Star Wars Battlefront II is loaded in DirectX 12 API mode on systems with Kepler GPUs. Color setting changes in the Nvidia Control Panel are not reserved on devices running the Windows 10 Fall Creators Update. Blue screen crash when Heaven Benchmark runs in windowed mode. Flickering issues on the internal G-Sync 120Hz panel when G-Sync is enabled on notebooks with GeForce GTX 1080 graphic cards.